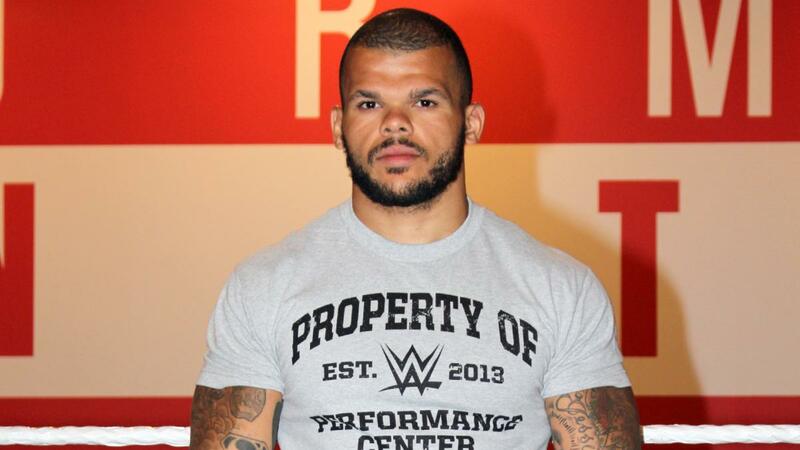 So WWE announced ten shiny new recruits that will be training at the WWE Performance Center today. All of whom will have hopes and dreams of causing a storm on WWE NXT and eventually rocking our worlds on Monday Night RAW and Thursday Night Smackdown, grabbing that brass ring and becoming bonafide WWE superstars over the next few years. But how does the class of April 2016 look? Is there anyone that could potentially become the next breakout star? Or will they all be on the vast WWE scrapheap by this time next year? Let's take a cheeky look at this lads and lasses. This big lad has been on WWE's radar since last Summer, so it was no surprise to see him finally get signed. Originally from Poland, Babatunde Aiyegbusim moved to the US to play for Brock Lesnar's former NFL side the Minnesota Vikings during their off-season period and despite only a short run for the team, connections made with comedian Jimmy Kimmel landed him a WWE tryout last summer in Orlando. He's a big lad at 6ft 7in and a billed 350lbs (closer to 330) and has reportedly impressed WWE big-wigs with his laid-back charisma and character. 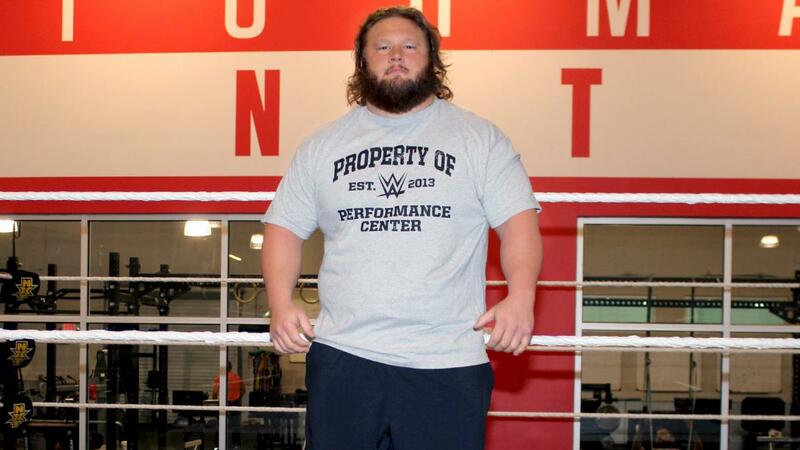 He has a lot going for him and if he puts the work in at the Performance Center, there's certainly the potential for WWE to have a new big guy to push. The main problem I see here is that certain higher ups within WWE will be overly impressed with his look and build and push him too hard and too fast, before he's adequately equipped himself with all the skills that their are to learn from the great trainers at the Performance Center. Another athlete that WWE have been keeping tabs on for a while now, Bianca Blair has completed in a variety of different sports, including hurdling during high school and college, before moving into CrossFit and weightlifting. She's said to have an impressive strength that will surely give her an advantage at the Performance Center, whilst her distinctive look should also stand her in good stead. In interviews she's revealed that she suffered from the eating disorder bulimia while at college in 2008, so there's a positive story to be told about her recovery that could make her a potential stand out on WWE's performance center reality series Breaking Ground. Again with no previous pro wrestling training a lot of this is all down to how well she reacts to the training at the Performance Center, but having shown an ability to shift between different disciplines in the past she very well may flourish over the next few years. Another big new recruit, Nikola Bogojevic is Greco-Roman wrestling star from Wisconsin. Having won a Bronze medal in the 2014 Pan-American Games and spent time training at the US Olympic Training Center, it will be very interesting to see how this near 300lber develops his in-ring style at the Performance Center. Another clearly talented athlete, but I can't find much about his personality or performance skills, maybe this will be something that he'll have to develop to get noticed over the next twelve months. The female recruits for this class are a real mix bag, with Carolyn Dunning coming from a bodybuilding and modelling background. I think it's difficult to suggest how Carolyn may cope in WWE, as the landscape of women's wrestling in the company has changed drastically over the last two or three years. Obviously thanks to her bikini bodybuilding and then modelling career, she's gonna look pretty damn good out there, but unfortunately for her there's a bit more to the females division in WWE right now. Considering Macey Estrella was the first name on the list with any formal training, there's surprising little information about her around. She's trained by a bloke called Tom Caiazzo at somewhere called American Premier Wrestling...both of which can also find hardly any information about, so I've no idea on the quality of the training or how much training she's actually had. However, her past in the US Marine and Marine Corps SWAT team will mean that WWE will be keen to push her, as they love all things US army. Formerly known as Nikki Storm on the independent circuit, Glencross has competed in ten different countries, including the UK, USA and Japan, over he 7 year career, so far. Most frequently seen in SWA, ICW and EVE, Glencross has a strong technical style that should allow her to mesh with the likes of Asuka, Bayley and Emma. I'd expect Glencross to be moved onto WWE NXT television perhaps as soon as the next set of TV tapings to help bolster the women's division that has looked a little thing on the ground since losing Charlotte, Becky Lynch and Sasha Banks not too long ago. Having previously been trained by NXT coach Robbie Brookside (as well as current ICW World Heavyweight Champion Big Damo) Glencross could very well end up being the shining star of the April 2016 class. Rounding off a pretty legit class of blokes, we have an All-American Wrestler, with a 32-2 record at the University of Iowa, Terrance Jean-Jacques. He's even competed in and won an MMA bout back in 2013. There seems to have been a push on big guys with this class and there's the potential that Jean-Jacques could get lost in the mix, in what is surely going to be a competitive group. However, he's got a strong look and we've seen amateur wrestler shine in WWE over the last six months with American Alpha being the best example. One problem for Jean-Jacques could potentially be a previously broken vertabrae in his back, but I'm sure we'll find out if that's going to be much off an issue as soon as he starts getting put through his paces by the NXT coaches. The final woman of the class, Danielle Kamela is a product of the KnokX Pro Academy, where she trained under WWE Hall of Famer Rikishi and former EWP Heavyweight Champion Gangrel. The pair have previously trained the likes of former WWE United States Champion Rusev, former WWE wrestler Troy McClain and former AAA star Steve Pain, so Kamela should have a strong foundation on which to build upon with WWE. Her lack of in-ring experience may also actually play in her favour, as she may well be easier to mold than those with more than herself. I'd also expect her time working for FOX Sports in Arizona to help her with the televisual performance element of her new job and wouldn't be surprised if WWE decided to utilise her as an on-air personality on NXT as she continues her wrestling training. The other half of TMDK, the man formerly known as Shane Haste is just as an accomplished performer as his partner. Holding many of the same accolades and achievments as Nicholls, thanks to their eight years tagging together, it would seem like a no-brainer that we've see Nicholls and Veryzer continue to tag together when they make their debuts on NXT. The Australian duo have the potential to make a splash in NXT's tag team division which has lost Enzo & Cass and The Vaudevillains over the last few weeks, with a potential clash with American Alpha being a mouth-watering prospect for anyone who's followed the two teams. Well that's the April 2016 recruits to the WWE Performance Center. I hope that you enjoyed this look at their prospects and found out a thing or two about the ten people who very well maybe the future of WWE. We'd like to wish everyone of the group the very best with their careers and look forward to seeing their progress over the coming months and years. Terrance Jean Jacques did not suffer a broken vertebrae. Source: ”There were some issues at home, I was rehabbing a broken vertabrae in my back and, financially, it was becoming too tough (at Iowa).